Craig Levein has been given a three-year deal after returning to the Hearts dug-out, owner Ann Budge has revealed. The former Scotland boss has moved back into the manager’s office at Tynecastle he previously occupied between 2000 and 2004. As the club’s director of football, Levein is a permanent member of staff who also sits on the board. Now Budge has confirmed the 52-year-old has agreed a deal as boss stretching to the summer of 2020 - but admits she faces a tough decision if he ends up suffering the same kind of results that necessitated the sacking of Ian Cathro four weeks ago. Budge said: “We have said (the timescale for Craig’s time as boss) will be three years. “One of thimgs I have been giving a lot of thought to is that if this didn’t work out, would I be in the situation where not only did I need a new manager but I also needed a new director of football. 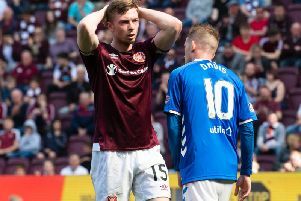 “It’s a serious question and a serious consideration for the club and that whole thing has been looked at in terms of it being the right thing for Craig and for the club. I’m confident it is. Jon Daly had been taking the team since Cathro was dismissed before the opening game of the new league season after a troubled six-month stint in charge. The Irishman, along with former Tynecastle servants Steven Pressley and Paul Hartley, were considered for the post, but Budge felt they could not compete with what Levein offered. The ex-club captain has not worked on football’s front-line since being axed by the national team in 2012. But he believes now is the right time for his return. Asked why he had taken the job, he said: “Because I was asked and because I wanted to do it. “There is a moment when it is right and that moment is now. The club is in a fairly healthy place. In my role as director of football, I’ve been able to build the club back up from where it was to the place where it is just now, which I think is in very good shape and makes it possible for me to do the two jobs at once. “I think Jon Daly did a fantastic job in the interim period. “What’s really important to get across today is that, in this moment in time, the club needed stability. It was very difficult for Jon to face the number of away games we have got [while the new main stand is being built]. Even the home games we have will be at Murrayfield. It’s a long time until November when we are back playing here.